AURORA, Ont. -- Magna International Inc.(MG.TO) reported its third-quarter profit grew compared with a year ago as revenue also climbed higher, but the auto parts maker trimmed the outlook for the year. The Ontario-based company, which keeps its books in U.S. dollars, says it earned US$554 million or $1.62 per share for the quarter ended Sept. 30, up from $512 million or $1.38 per share a year ago. Revenue totalled nearly $9.62 billion, up from $8.86 billion in the same quarter last year. However, Magna lowered its expectations for 2018 light vehicle production in North America to 17 million units, compared with its earlier forecast of 17.2 million. The forecast for European production was lowered to 22.5 million from 22.6 million. In its outlook, the company now expects total sales between $40.3 billion and $41.4 billion this year, down from between $40.3 million and $42.5 billion. 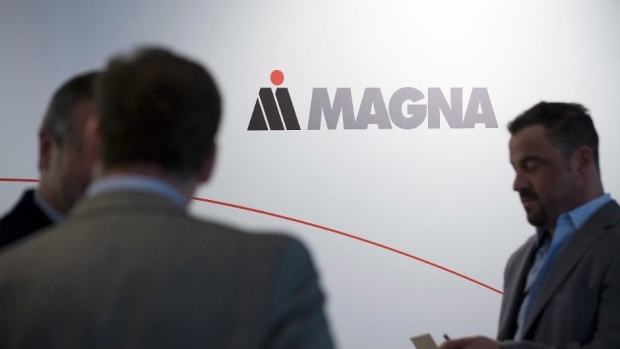 Magna also lowered its profit expectations for 2018 to between $2.3 billion and $2.4 billion, compared with its earlier forecast of between $2.3 billion and $2.5 billion.